The use of precast panels has helped create a stunning new monument to Australia's past in the nation's capital. 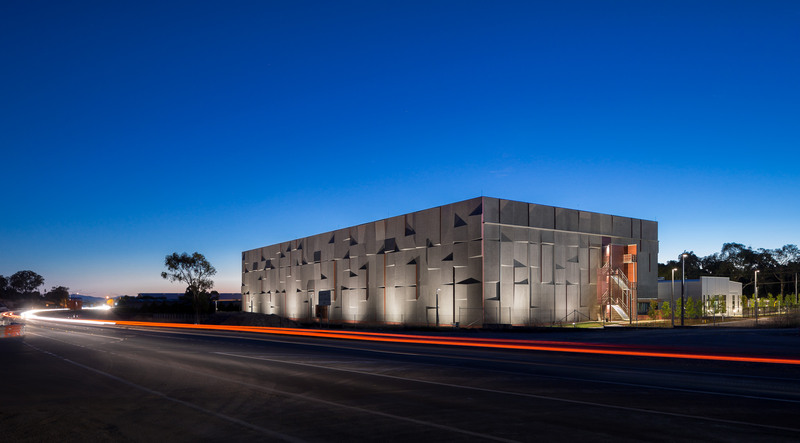 The National Archives Preservation Facility, in suburban Mitchell, Canberra is a records storage, management and preservation facility consisting of two 'boxes' separated by an enclosed, light-filled spine. One 'box' houses records, the other admin and preservation workspaces for staff. The spine provides centralised access to both buildings. The windowless concrete storage building is constructed largely from patterned, precast concrete panels. Senior Architect of May + Russell Architects, Yuri Leong Maish, says the form of this building is symbolic of its function as the keeper of the nation's collective memory. "We really wanted to express, through form and colour, the passage of time," she says. Because this 'storage box' faces a key commuter corridor connecting Canberra's northern suburbs to the city, Yuri and her colleagues were particularly keen that the building engage with the public as they passed by in the morning and evening on their way to and form work. The three-dimensional precast concrete façade presents as a seemingly random pattern of raised, angular surfaces that, in turn, create a changing pattern of shade as the sun tracks across the sky. Coloured, anodised aluminium fins fixed to the inside edge of the raised concrete surfaces reinforce the notion of time passing. From the southern end of the building, the fins are orange in colour; from the north, a deeper raspberry tone - representing both the colours of dusk and dawn, and the earthy tones of our ancient land. The patterned, concrete panels also work to break down the visual mass of the three-storey building. Each measuring approximately six by three metres, the panels are stacked vertically, three to a stack. In total, there are 210 precast panels fixed to three sides of the building (the fourth elevation form one side of the internal spine). Nine different moulds were used to cast the panels. We anted variety while at the same time minimising the number of forms used in the precasting process," says Yuri. The panels were manufactured by Bianco Precast in Adelaide and transported to Canberra, two per truck, over the space of a couple of weeks. At the height of the project, the on-site construction contractor - Doma Constructions - was erecting up to 13 panel a day. Despite the logistics, the process went very smoothly. Yuri has nothing but praise for the contractors, in particular Bianco. "They were incredible to work with," she says. "Precasting is an art form to them. They took so much pride and care in each process." The surface of the panels feature a sand-blasted finish which exposes the 20mm aggregate (a mix of predominately warm stone with some white) to create a consistently weathered, textural finish. The second 'box' on the site, where the archivists largely work, is a lightweight contrast to the heavyweight concrete building. While the latter represents the past, the former looks to the future. The lightweight frame of the admin and preservation building is clad with an interlocking extruded aluminium panel system. The two 'boxes' are connected and accessible by the 90 metre-long spine, formed by the adjoining walls of each 'box' and covered by a glazed skylight running the full length. The 'storage box' wall features multi-coloured terracotta panels, the pattern and colours of which are inspired by a painting by Brazilian-based artist Petrillo - again, a visual representation of the passage of time. One of the most pleasing aspects of the project for Yuri and her colleagues is the reception the facility has received from the archivists who call it home. "Our aim was to create something that changed the perception of their workplace, and reinforce the importance of what they do," she says. "To that extent, we're very proud of the outcome. The archivists are now within a transformed environment, far from the 'big shed' mentality, in a building expressive of what they do for our nation."